Ray Marshall vase - 7" (177 mm) high, 6⅞" (174 mm) diameter. 1961. Canadian Ray Marshall was born in 1913. Service in the Second World War took him to England, where he settled. After studying, part-time, at the Guildford School of Art, he went on to the Royal College of Art in London. In 1946 he joined Ray Finch at Winchcombe for a time and then a craft workshop in Surrey. 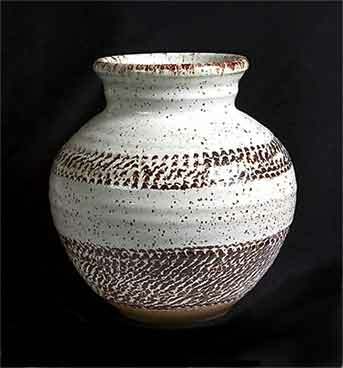 He set up Milland Pottery in Hampshire in 1948 and then a workshop in Stedham, Sussex, in 1952. In 1957 he left the Milland Pottery and continued on his own at Stedham. He died in 1986. His work is exhibited in the Victoria and Albert Museum.